Me too, based on Zeng & Fan's Beta plots. For TE013 its the same game for the end plates, no difference. At the side walls the matching point is all lambda/2. You are correct. NASA agrees with you: March made it clear in previous threads. NASA measured no thrust whatsoever when resonating at mode TE012 without a dielectric. Their computer modeling shows that TM modes are better. Lastly, NASA is the only research organization up to this date that has clearly measured the resonance mode shape. Shawyer and Yang never reported on any measurements showing that the operating mode shape was the mode they thought it was. Only NASA verified the mode shape with a thermal camera. I hope that TheTraveller and others use a thermal camera to verify the mode shape of operation of the EM Drive under operation. Excellent analysis and undeniable conclusions on your part. Perhaps there is much greater degree of latitude with which people that have been in this thread for a while are willing to look at EM Drive data, and that's the reason for some responses. 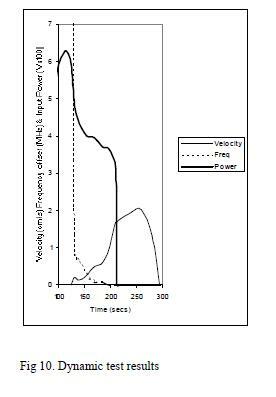 Look at it this way: when EM Drive thust results between different experimenters differ by ORDERS OF MAGNITUDE (not just a few percent) , and since people have seen such huge variations in data, then people are willing to forgive time delays of seconds, or even really anomalous response like the velocity increasing after power is turned off. Our human tolerance on deviations is highly dependent on what we are accustomed to see. Some time ago one poster was asking for 4 sigma experimental results. Ha Ha. That will be the day 4 sigma for the EM Drive. There are a number of anomalous time delays associated with EM Drive experiments that are very difficult to reconcile with electromagnetism. NASA uses TM mode as they need a axial electric field to excite their dielectric. When Shawyer used dielectrics he also excited in TM mode but how that he no longer uses dielectrics, TE013 is his mode of choice. Why? Because as Prof Yang found and reported, the H field being axial imparts more momentum transfer than does an axial E field. As for the EW null Force in TE mode without a dielectric, we both know there is no resonance in any mode for their copper frustum at 2.45GHz. So it is not that TE mode doesn't produce Force, just no resonance, no Force. You will not give it up will you? Shawyer has explained why that happened. You know what he reported yet refused to quote it above. So why hide what you know he said? Please note when power was on there was acceleration and when power was turned off there was no acceleration. ...As for the EW null Force in TE mode without a dielectric, we both know there is no resonance in any mode for their copper frustum at 2.45GHz. So it is not that TE mode doesn't produce Force, just no resonance, no Force. Please go back and re-check your notes: without a dielctric they tested TE012 mode at 2.168 GHz, not 2.45 GHz. This is very close to both the NASA COMSOL FEA prediction for TE012 and to my prediction (I think I calculated around 2.2 GHz from memory). Your Excel spreadsheet may predict a higher frequency (I recall you predicted 2.3 GHz) but usually your Excel spreadsheet predicts natural frequencies higher than my calculations, depending on the mode shape. If you are performing an integration, do you have the means to increase the number of integration points by a multiplying factor of 100 and see what difference it makes in your predicted results? Look at it this way: when EM Drive thust results between different experimenters differ by ORDERS OF MAGNITUDE (not just a few percent) , and people have seen such huge variations in data, then people are willing to forgive time delays of seconds, or even really anomalous response like the velocity increasing after power is turned off. You also know what Shawyer said caused that event, yet did not quote it. Selective use of data to make a point? Trust me I will really enjoy watching quite a few of you, in a few months, eat your hats as you try to climb out of the holes you have dug for yourselves. BTW a friend has helped me to fine tune my frustum dimensions so it will operate extremely well at 2.45GHz, excited in TE013 mode via a coax excited antenna. Am I confident? 100%. Better get those hats ready guys. The only rubbish is the spin you put on the data. I will really enjoy watching you eat your hat as you climb out of the pit you have dug for yourself. I've become a big fan of the slosh propellantless drive. Seriously, in seven whole years this is the best data available? You'd think at least the slosh would be fixed. And all the extra weight. And curves showing position against time for different all-up masses. Come on. Why would you think that I would recall what Shawyer may have said or didn't say? I recall my children as they were growing up, how much fun I had when I was in school, loving faces. ...I am also not trying to convince or dissuade or argue with anyone else. I find it extremely...uhhhh...distasteful and counterproductive. For business my favorite partners are people that can strongly disagree with me, have different points of view and not be afraid to tell me so. I really appreciate their disagreements as they have saved me from making bad trades. Same for engineering projects and starting business ventures.